Gasket Installation Training | Triangle Fluid Controls Ltd.
Gasket leaks are dangerous, expensive & preventable! If you are a pipe-fitter, maintenance personnel, engineer, or gasket distributor & fabricator, we have the right training program for you! Download our Gasket Installation Training Flyer NOW! The Bolt Load tries to keep everything together while the Hydrostatic End Force tries to push the flanges apart which stretches the bolts and can lead to lower gasket compression and the Blow Out/Internal Pressure forces the gasket out of the flange. Approximately 75-85% of all bolted flange joint failures relate to uncontrolled gasket installation and joint assembly practices. The clamping capability of a bolt is determined by its elasticity or ability of the bolt to return to its original shape after being deformed; making bolt selection very important. Because friction works against you, it is important to apply lubrication to both the bolt and nut threads, as well as the nut flange facing in order to reduce the friction. Effects of over tightening reduces the gasket contact area and can cause the gasket to crush toward OD. This allows fluid to penetrate the gasket ID leading to deterioration and will result in leakage. Effects of under tightening allows fluid to penetrate gasket ID leading to deterioration of the gasket. Underloading can lead to blow-out or leakage. Unloading caused by temperature or pressure cycling can have the same effect. 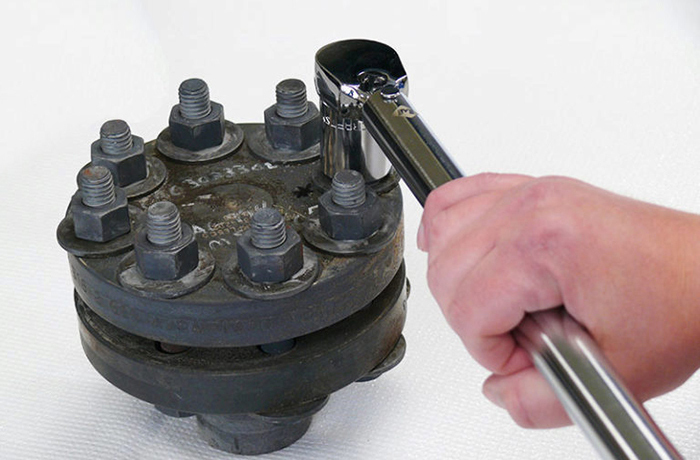 Make sure your system is at ambient temperature and depressurize and inspect the flange condition & alignment, the condition of fasteners and make sure flange surfaces are clean. Always use a new gasket and never use more than one gasket in a flanged joint at a time. Proper Gasket Installation will increase the life of the gasket, reduce your maintenance costs and reduce leakage. Are you interested in having a gasket installation training seminar at your location? Call now at 1-866-537-1133 or send us an email request here. From beginner to advanced training options are available. Let us custom fit your needs! Our Gasket Installation Training Program Overview is available for download here. Instruction will be given by our resident Certified Engineering Technologist, Chett Norton – designation through OACETT and currently enrolled at Memorial University (MUN) – Engineering & Applied Science, undertaking a Bachelor of Technology. Additionally, Chett has trained and completed all 4 courses through the ASME program – Bolting Specialist Qualification Program.